You've got to give them credit: the band name is clever, curious and humorous. How did these five Brighton mates come to Death Ape Disco? Possibly the pulled out their Oxford English Dictionary (Abridged, of course), let it drop open three times, and picked three words with their eyes closed. Death Ape Disco:: it's the best picture I could find. And where did the album title come from? Possibly an homage to one of their influences, Soundgarden and the now classic Superunknown? 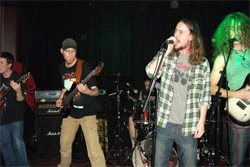 Death Ape Disco delivers some relatively spicy and groove laden melodic heavy rock. You'll find some of their other peers and influences like Down, Alice in Chains, Clutch or Kyuss woven in theses tunes. 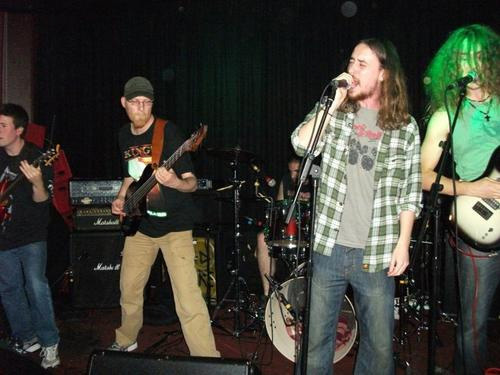 Though it's hard slip DAD into the whole stoner genre as they play rather fast at times. However, so does Orange Goblin at times, another influence and one that some put in the stoner camp. Most of the songs are characterized by a wall of riffage, big drums, vigorous bass, and Rob Rainford's throaty, sometimes screamo, vocals. But there's also some real imagination in the arrangements. One is the guitar outro in the latter quarter of Grinding Down the Sun. Another is the guitar and bass interplay at the beginning of Suffocate. You get something similar to this at the start of Eclipse, a song which develops that aforementioned strong groove and finds Rainford mellowing down a bit. There's a song named after the band which basically shows the eccentric and generally nonsensical lyrics across the entire album. The album closes with Mars, an arrangement that sounds like a mash up of Soundgarden and Orange Goblin, maybe with some Coheed and Cambria thrown in. It's all interesting stuff and an entertaining romp, even if the album is too short. With seven songs at 34 minutes Supervolcano is nearly an EP. Recommended. 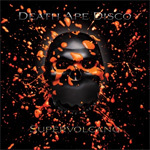 With Supervolcano, Death Ape Disco offers curiously entertaining melodic modern heavy rock that will keep your interest and, quite possibly, asking for more.